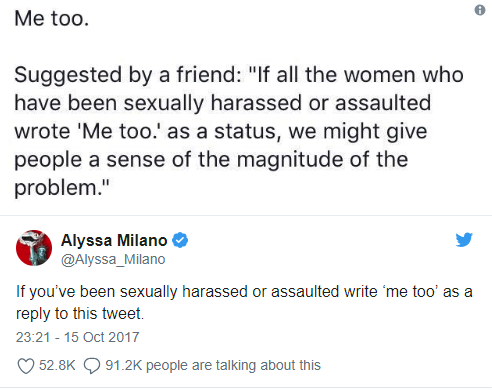 The #MeToo movement started off with a simple tweet on Sunday night, October 15th 2017, by activist and actress Alyssa Milano. Lying in bed next to her daughter, she saw a post by a friend online saying, “If all the women who have been sexually harassed or assaulted wrote ‘Me too’ as a status, we might give people a sense of the magnitude of the problem”. No one could have predicted the light a single match in the dark would create when Mrs. Milano tweeted it. By the time she awoke Monday morning the tweet had garnered over 30,000 replies and by Monday evening it had surpassed 53,000 comments, including stories from other celebrities, women and men alike. A single match sparked a flame of allegations against Harvey Weinstein and other industry giants. Women decided it was time to step forward and share their stories. Social media can be a powerful tool for change, as it proved here. What started as a single tweet inflamed not only the nation, but the world, casting light into the darkest of places. While a number of celebrity responses certainly drew attention, what truly gave #MeToo global traction was the sheer number of stories brought to light. Sparked by others’ bravery surrounding the topic of sexual harassment and assault, women and men around the world could no longer stay silent and decided it was time to take back the truth. Thus began the string of allegations against powerful industry giants that had been festering for years and in some cases decades. Being in a position of having power and influence over others could no longer protect abusers from the whirlwind that was to come. This movement gave individuals the courage and support they needed to speak out, and the world stood with them. No longer is the individual being subject to inappropriate behavior the accused or the blamed, they are the brave, the light in the darkness. #MeToo isn’t just a hashtag, a platform, or a movement. It is so much more. It’s liberating. It destigmatized an issue many felt couldn’t be spoken about for fear of not being taken seriously or hurting their career. Not speaking about an issue as consequential as sexual harassment will only enable it and create a culture where abusers feel safe. Liberating the topic of sexual harassment has allowed for the world to realize the severity of this issue and finally step into the light, rather than hide in the shadows. This conversation is the first step towards the change the world needs. It leaves harassers with no dark corners to hide in. It is why #MeToo became the torch-carrying movement representing hope for a better future. VinciWorks’ new online course on sexual harassment and bullying at work, MyStory: Harassment and Bullying at Work, has directly applied the lessons of the #MeToo movement and the wealth of research into why traditional sexual harassment training doesn’t work to create training that does far more than simply fulfill the compliance requirement to train. You can try the course for free here. This entry was posted in Harassment, Thought leadership on 31st July 2018 by VinciWorks.